Another malicious, extra-dark comedy from the Coen brothers. Car salesman Jerry Lundegaard (Macy) hires a couple of losers to kidnap his wife so he can swindle the ransom money out of his father-in-law. Naturally, the scheme begins to unravel and the very pregnant police chief Marge Gunderson (McDormand) treks through the frozen tundra of Minnesota to put the pieces of the puzzle together. McDormand's performance as the chatty competent chief is first rate. Needling the flat-accented Midwesterners of their youth, the Coens have also returned to their filmmaking roots after the disappointing big-budget "Hudsucker Proxy." Because Minneapolis was having its warmest, driest winter in 100 years, the Coens were forced to shoot most of the exteriors in wintery North Dakota. Download Fargo in Digital HD from the iTunes store. Fargo images are © Gramercy Pictures. All Rights Reserved. A film about greed and violence that is sometimes classified as a comedy proved to be Joel and Ethan Coen's first major breakthrough to mainstream audiences. 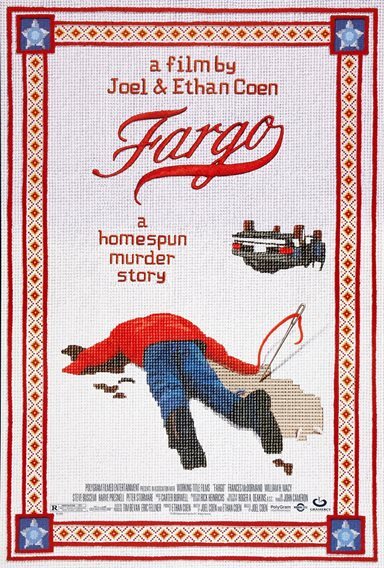 Earning seven Academy Award nominations and winning two—Best Original Screenplay and Best Actress—Fargo shows the darkest and brightest sides of humanity against a backdrop of barren fields of snow. But it is nothing as lofty as the Coen brothers' exploration of good, evil and individuality that made Fargo a blockbuster success. The immense draw of the film is attributable to brilliant writing and a quirky cast. The Coens' odd portrait of Americana is delivered in seductively quotable lines about someone "goin' crazy out there at the lake" and "a no rough-stuff type deal" and the ultimate deadpan line about an "accomplice in the wood chipper." With its unique characters and infectious "you betcha" dialog among Nordic descendants, Fargo smacked a home run with audiences around the world. Now MGM has issued the dark comedy in high definition, with excellent picture and sound. It's the third Coen brothers' movie to be released on Blu-ray, following No Country for Old Men and Burn After Reading. The story of Fargo is by now well known, and has been thoroughly studied and analyzed since the film's release in 1996. The narrative has all the more gravity after the words appearing at the beginning of the film: "This is a true story. The events depicted in this film took place in Minnesota in 1987. At the request of the survivors, the names have been changed. Out of respect for the dead, the rest has been told exactly as it occurred." Turns out, that is not true. The crimes are loosely based on separate incidents that occurred elsewhere in the country, but as for the characters, setting and narrative, they are purely the invention of the Coen brothers who grew up in a suburb of Minnesota. Why did they lead off by promoting Fargo as a true story? The answer lies in some of the bonus content, in which the brothers theorize audiences would care more about real characters than about fictional ones. But with the brilliant acting and eclectic assortment of colorful personalities featuring Marge Gunderson (Frances McDormand), Jerry Lundegaard (William H. Macy) and Carl Showalter (Steve Buscemi), it's debatable whether there is any advantage in billing the action as a true story. Contrary to the Coens' own theory, their fictional characters command attention and in this case, fiction may be stranger than fact. The script is that masterful. It centers around a staged kidnapping plot gone horribly awry, and the seven-months-pregnant police chief who tries to make sense of a string of murders and end the crime spree. The film shows the desperation and greed of the men on the wrong side of the law in contrast to the good-natured, tenacious Marge. From the premise to the closing moments, the motives, language and landscapes are so alien to the average viewer that the overall effect of watching it is almost like going on a vacation. Fargo is a trip. Even forgetting about the plot and taking the scenes one by one, they are shocking in their conception, offbeat humor and deceptively simple design. Right about the time you see bug-eyed Showalter tell the gargantuan Shep Proudfoot (Steven Reevis) to "smoke a f—kin' peace pipe" you realize that the action and delivery might just be most brilliantly unconventional of any film. When Marge interviews the prostitute who slept with Showalter, the dialog is pure Coen magic that starts out quirky and becomes borderline outrageous. But almost every scene has such moments. The way violence unfolds is also executed with a raw vision that is trademark Coen brothers. For example, the highway multiple homocide at night starts out conventionally, but the camera unrelentingly shows every detail as the scene builds in intensity, culminating in the brutal murders. Cinematographer Roger Deakins serves up the characters and long snowy plains of Minnesota and North Dakota in simple strokes of artistic grandeur. The Coen brothers show only what they need you to see. And Deakins ensures that the photography and composition are technically impeccable, as he did when collaborating with the Coens in No Country for Old Men or as a consultant for Pixar in Wall-E. The extraordinary imagery, plot, script and acting all boil down to Marge's actions and observations prior to the closing moments when she calmly renders her judgment on the violence that tore apart her precinct. "For what? For a little bit of money. There's more to life than a little money, you know. Don't you know that? And here y'are. And it's a beautiful day. Well. I just don't understand it." Movies just can't get more poignant than that. The re-mastered Blu-ray excels for several reasons, starting with the famous opening shot of Jerry Lundegaard's vehicle emerging from the white darkness of snow and clouds as he approaches his fateful meeting with the two kidnappers. On the old disc, the white field flickered at the sides, but on the new one it remains rock steady, providing a solid background for the spare credits that appear as Carter Burwell's score warns of impending disaster. The aliasing and video noise that occasionally showed up in forests and other scenes with fine edges are gone altogether, and additional detail is now visible in darker scenes, e.g. the exterior of the King of Clubs when Jerry drives up to it, the interior of the cabin where Carl and Gaear hide Jean Lundegaard or the roof of the parking garage where the fateful ransom drop occurs. From the opening sound of the evocative instrumentation by Carter Burwell to the characters' voices to the blast of gunshots and open-throated engines, the DTS-HD MA audio track of Fargo is a pleasure to hear. Like the picture quality, it's a significant upgrade in definition and refinement. The soundstage up front is narrow but deep, and very little use of surrounds is apparent—just a touch of ambience in the music and some of the louder effects like car engines. Treble is a bit bloated here. Watch the scene where the kidnappers break into the Lundegaards' home. Commentary with Director of Photography Roger A. Deakins is very low key, with quite a few pauses, but delivers a few tidbits about lighting and the like. This would have been much better with a few other participants to fill in the blanks. Minnesota Nice Documentary (SD; 27:47) is an above average EPK featuring lots of interviews and footage from the film. American Cinematographer Article is a reprint of an article by Chris Probst about Roger Deakins and the film. Unlike with, say, the original Robocop, the improvements offered by the remastered Fargo aren't so dramatic that I would encourage everyone to run right out and replace their existing copy, especially since there are no new extras to sweeten the deal. 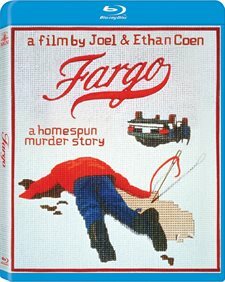 But anyone who is buying their first Blu-ray of this Coen Bros. masterpiece should certainly acquire the new version, and Coen fans should consider adding the new disc to the Blu-ray.com price tracking tool to await the inevitable bargain. With those caveats, recommended.